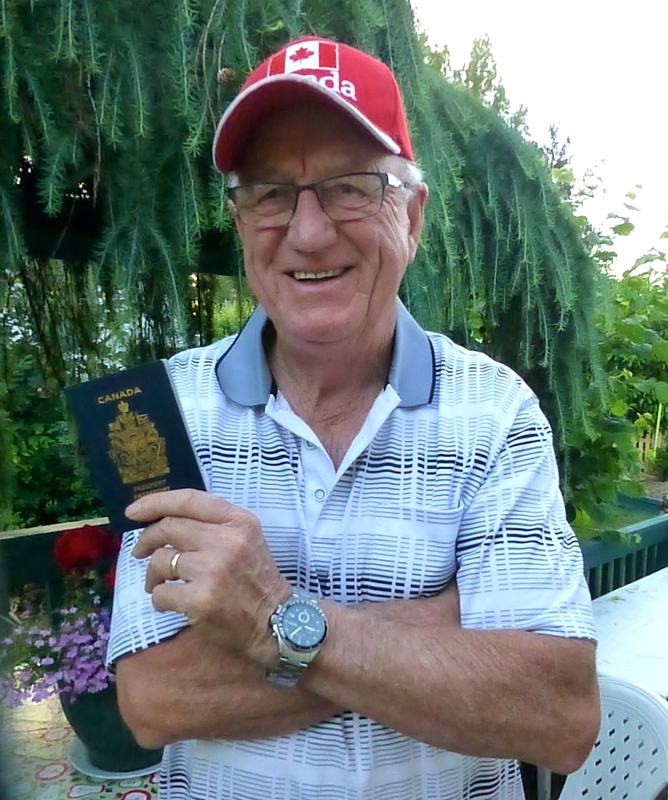 Harold holding his new Canadian Passport that was issued a few days back and is now valid until 2025. About 53% of Canadians hold a passport, whereas the US stands at 20%. Given that most new Canadians apply for a Canadian passport (reference comments in footer), there must be a high percentage of natural born Canadians that have never bothered. As many Canadians only use their passports for travel to the United States, Mexico, Cuba and other the Caribbean states, a large percentage of our population have never visited other parts of the world. Visions of the World, was first written and posted on Facebook in early 2014. It is now updated and includes the following introduction. What prompted this re-post was a horrendous act of domestic terrorism in South Carolina carried out by a White Supremacist. The case might make the front page of media outlets for a couple of days and will then drift off into history. A mass killing of Black people, at a church service no less, occurred in Charleston, South Carolina, on Thursday, June 17, 2015. It was widely reported as a “tragedy, a terrible thing” but pause to consider how different it would have been had the killer carried a Koran and expressed Jihadist sympathies rather than wrapping himself in a Confederate Flag and spewing White Supremacist hate slogans. Had the former been the case, the United States today would be on High Alert and Charleston, perhaps all of South Carolina in a state of Lockdown as authorities searched for personal and organizational connections to the killer. No stone would be left unturned as politicians waded in and media endlessly lamented on the incredible danger terrorism presents to the United States and the world. Think back to what happened in the United States and Canada after the Boston Bombing. Make no mistake, what happened in Charleston, North Carolina was a clearly defined act of terrorism and behind the scenes White Supremacists encouraged and condoned that act. White Supremacists do what all racists and terrorists do, they blame someone else or some group for their own shortcomings and lot in life. Don’t think for a moment that young killer suddenly woke one morning and found himself to be a White Supremacist. No, what infected his mind and finally drove him to commit mass murder was a hatred of Black people spawned by an undercurrent of racism in his country. The difference in this case – White Supremacists are not considered threats to the American way of life as they are part of the American way of life. In many parts of the world they would be considered a terrorist organization and dealt with accordingly. Does Canada list them as a terrorist group. No? Take that circle and square it! 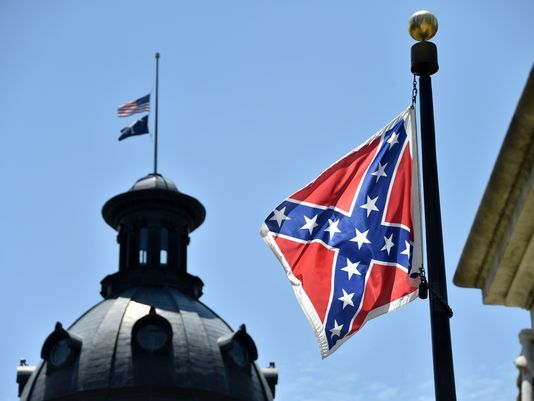 Photo (Web Source): Atop the South Carolina State House, the U.S. flag and South Carolina’s palmetto flag flew at half-staff, while the confederate flag remained proud and unbowed at full staff. That confederate flag, so prominently displayed on the State Legislative grounds is a display of its unabashed strength in North Carolina and provides an excellent example of the undercurrent of domestic terrorism that swirls through the United States on a daily basis. White Supremacists do Al Qaeda and ISIS proud. The following earlier post discusses a few of the conditions that have led some to commit outlandish acts such as that which occurred in Charleston. While Canada does somewhat better than the United States, we all too often blindly follow the lead of that country. While White Supremacism (and other forms of racism) is not as prevalent in Canada, it still exerts as a significant force, yet it is largely left to go unnoticed when compared to the amount of airtime given to foreign (Jihadist) type terrorism. We hold many views about other countries and while our outlook is generally positive, when negativity kicks in, that negativity speaks more to personal insecurities tinged with fear and resentment than any real threat presented by another country or group of people. For most people ‘our country’ is always the best, but we will make exceptions when it comes to various groups. In multi-cultural societies built on immigration, target groups often tend to be a visible minorities. In Canada, our First Nations people have often filled the bill just as do Blacks in the United States. Since 911 however, Muslims have taken a large part of the flak not only because of extremists within their ranks, but also because their religion, customs and view of the world often seems at odds with white, middle class values that defines much of mainstream society in the West. Experience suggests our worldview is frequently skewed by stereotypes and myths perpetuated by the media, government, big business and our own prejudice that is often, but not always, rooted within family groups and our close circle of friends. While our views change with age, they can also be changed overnight by a major event. There was no better example than by how the world shifted on its axis after 911. In that transition we found a whole new group of people to fear and loath as the war on terror ramped up. Over the longer period of the past century, two World Wars, the Korean War, the Cold War, Viet Nam War and a dozen other major confrontations and initiatives (e.g. Gay Rights, Woman’s Rights, Abortion Rights, etc. ), precipitated similar shifts in the thinking of people of the day, in particular those who felt their way of life was being threatened. That being said, and regardless of the ongoing war on terror, we seem to have settled down somewhat in the past thirty years in large part because our opportunity to travel the world has increased exponentially. Direct interaction and experience with other people, particularly those who hold vastly different customs and views of the world, often changes our perception in a positive direction. News media reports more often tend to change our views in a negative direction. For those having the means and the inclination (and many young people from first world countries today have plenty of both) travel is a good way to check out the world as it is rather than as we think or have been taught, it is. The trek is as simple as grabbing a backpack and taking off, something more and more young have been doing in recent decades. Some countries even encourage youth to spend as few months or years travel before they begin University or start a career. In Israel travel is highly encouraged after completing high school and spending a mandatory three years of service with the Israeli Defence Force. Each year 30,000 – 40,000 of those discharged, take up the challenge and spread out around the world (Out of Israel and into the World). Many young people in first world countries also choose to combine travel with volunteer service and that certainly helps to contrast their (our) privileged position with others. Few could arrive home without having gained a new insight and respect for those living in other countries, particularly third world countries. Granted, travel to some countries is not recommended, with North Korea and Syria coming to mind, but travelling to other countries such as those having different forms of Government (e.g. Communist rule as in China; Oligarchy in Russia or several Middle Easter and African countries where control and poverty often go hand in hand) is worth every penny given the experience gained. While our media generally keeps us well informed, they often tend to skew the news in a manner that promotes fear. Many around the world might well be cautious of travelling to the United States if they followed the news stories emanating from that country. 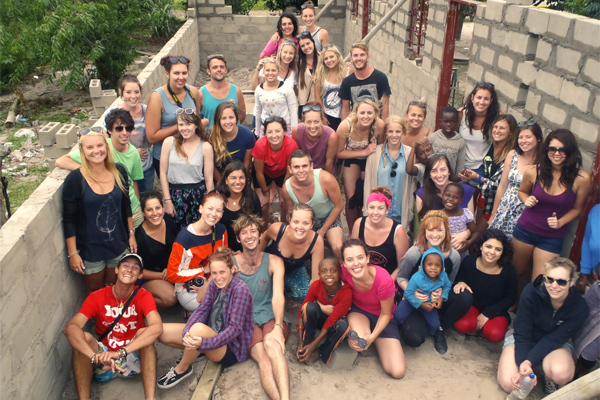 Photo (Web Source) Young people volunteering in Africa. Another example close to home is Cuba, a country that lived under draconian US sanctions for several decades. Wow, what a seismic shift for that country, but whether that shift will lead to democratic reforms remains an open question. I don’t think many living in Canada would opt for the governance style of Cuba, China, Russia or any other country where control is centralized within a small group of privileged individuals. In many places Lynn and I visited in recent years, places where strife or war seemed to be a constant (e.g. Israel, Middle East, Far East, Balkans) it was surprising to observe that many people have a very positive attitude towards life and that fear is not a factor that defines every waking moment. In Canada and the United States we likely live with greater fear of some kind of attack than do the people of Israel. Why? Partly because our government and the media tell us it is so. It is quite astounding at how easily we can be led down the proverbial garden path. A tourist travelling to any of the hundreds of countries that face a myriad of challenges such as Israelis and others in Africa, the Middle and Far East, will not only find a treasure trove of historical sites that will take them back to antiquity, they will often find a large percentage of the citizens doing pretty well, not nearly as well as in Canada, but never-the-less things OK. As a simple measure of how well a country is doing, take a little time to engage with with young people. It is our considered opinion that if young (in their twenties and thirties) are desperate to leave a country, the country is not likely doing very well politically or economically, but if that same group is happy and welcoming, even if they have a standard of living much lower than our own, things are probably pretty good. Older people on the other hand are not as good a measure as they often tend to think of earlier times as having been much better than present, just as do many older people in Canada. 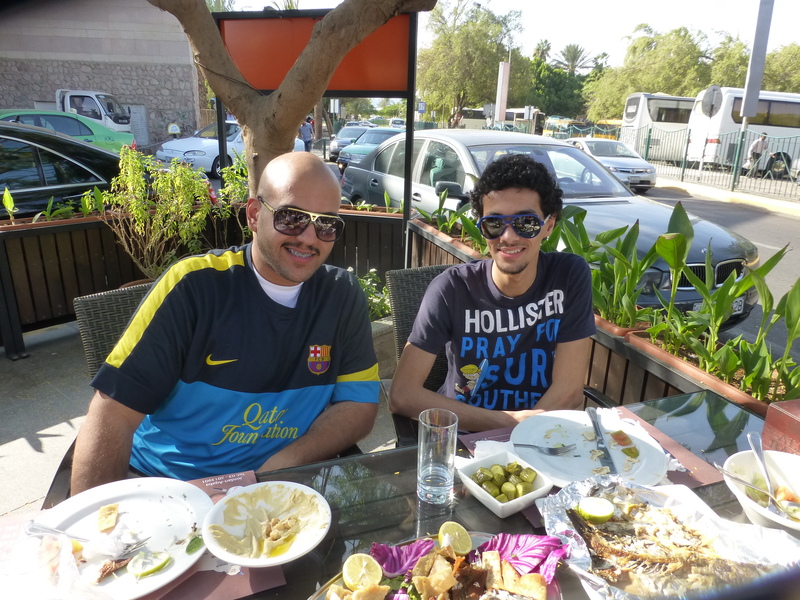 Photo (Personal Files): We met these two young men from Saudi Arabia while having lunch in Aqaba, Jordon. It was a short visit, but have since become friends on Facebook and follow each others travels. Had the time been available we would have certainly travelled to Saudi Arabia. Of course, none of this holds true for war or poverty ravaged countries such as Syria, or other nations in financial crisis. While conflict has been greatly diminished over the past century, many in the West and other first world countries tend to see the world going as going to hell in a hand basket and that the apocalypse must be just around the corner. Perhaps if people switched from news broadcasts to the Knowledge Network or similar TV Stations broadcasting documentaries about other countries, they would begin to feel much more positive. To see how perception plays such a strong role in shaping our worldview, a few may have read a recent FB post I made about an immigrant family who arrived in Canada just a few years back (posted below). It was inspiring to witness how much the person we met and her family valued living in a country that has a Charter of Rights and Freedoms, something that is only a dream in their home country of Iran. As time permits I will continue to write about countries we have visited where the culture, political system and religious beliefs are quite different from our own. Better yet, take some time and explore other parts of the world on your own and then let us know about your experience by writing a few comments about your experience. A neat thing happened as Lynn and me were on the way out of Country Grocer (West Saanich area of Victoria B.C.) this afternoon when a woman, about 40 years old, came out in tears. We noticed she was holding a Canadian Passport along with an Express Post envelope. I asked if everything was OK and she said “yes, yes, I just got my Canadian passport today.” She handed it to us and we were the first people (beyond herself) to see it. It was an emotional moment. This woman and her husband immigrated to Canada in 2009 when their children were twelve and fourteen. The children are now 17 and 19. The children, along with her husband and herself received their Canadian Citizenship in 2014 and today she was the final family member to receive her passport. Her whole family is now full-fledged Canadian citizens. Talking to this woman and then hugging her as we left, reminded us both that Citizenship in this country is something to be valued and that no matter what our political, religious or ethnic differences, we are part of a diverse family living a country that is free and we always need to work hard to keep and value those freedoms. These freedoms can be traced directly back to a document called the Magna Carta which was written in 1215, a historic document that is the precursor to our own Charter of Rights. The Magna Carta, now 800 years old, is presently being displayed in the Canadian Museum of History in celebration of the evolution of our own country. Link to Magna Carta on display.